DESCRIPTION: Nature, exquisite foods and luxurious beverages intersect flawlessly at the Point Bar at Merriman’s Kapalua. The gorgeous deck area has loungy comfortable seating, umbrellas for shade, even a couch and a fire pit for sundown. The expansive area beckons to the wild east coastline of Molokai; it’s like sitting on the bow of a luxury yacht. 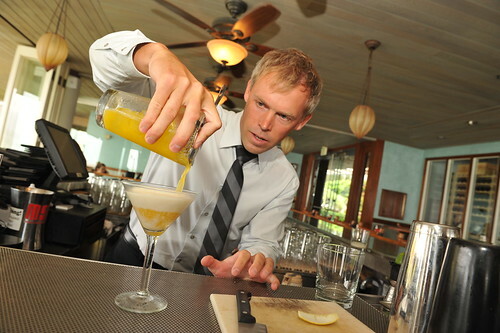 For the last few years, Merriman’s used it as a wine bar, but people kept lusting for cocktails in this pristine outdoor environment that also overlooks Kapalua Bay. With Chef Peter Merriman’s menu, Jeff Groh, Wine Director and Beverage Manager, meticulously hatched a plan and a hand-crafted cocktail menu that would deliver one of a kind flavors with Maui-grown products. Hence the Point Bar is the perfect place to spend a peckish afternoon sipping away at scratch-made libations and impeccable pupus. GROH LOG: Jeff Groh instantly fell in love with the restaurant location and romance of living on Maui, so he whisked himself away from his Oregon home to steer the beverage program as Wine Director and Beverage Manager at Merriman’s Kapalua. With lots of accolades like “Best Sommelier” in Portland by Tasting Magazine and “Best Beverage Professional in the Pacific Northwest,” his style is innovative, but it hasn’t all gone to his head. Jeff loves to live and breathe potations. He says he brewed his own beer before he could buy it. Groh’s wine list for Point Bar cleverly alludes to physical phenomena with selections under wines for sun and wines for shade, and champagne under “Every Sunset is a Celebration.” The cocktail menu is rife with homemade sodas, syrups, fresh garden herbs and artisinal spirits. It’s a glimpse of what urban bars are doing at the moment. Groh makes it relevant to Maui without the trendy prohibition handlebar mustache, suspenders, pomp and circumstance. “A drink doesn’t get better than its base spirit,” says Groh. The cocktails are so balanced you could serve them on a tightrope. COCKTAIL MENU AND PUPU MENU: The pupu menu showcases Merriman’s prowess with local produce from nearby farms. 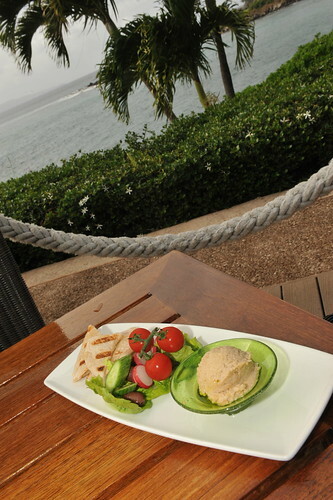 For instance, the taro in the smoked taro hummus is grown in nearby Honokohau valley. Merriman also shows it off in the taro fritters and the pan-sautéed Lehua taro cakes. 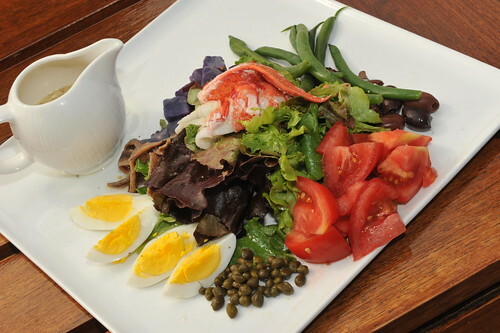 The Nicoise salad is out of this world with Keahole lobster, prime filet mignon or seared ahi. Parmesan truffle fries and prime filet sliders with applewood bacon are just as spectacular. You’ll recognize the island’s tropical fruits are put to their best use with liquor: vodka and fresh pineapple cocktails with sage, Cazedores Tequila and mango, or the passion fruit and Ketel One. Anything with their coconut foam is amazing. 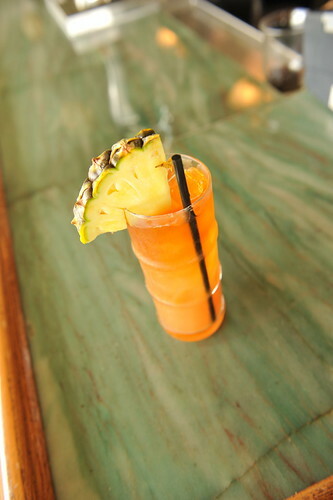 Mai Tais come two ways: flor de cana or mixed with Kauai’s Koloa rum. Bourbon under the sun is doable decked out in St. Elizabeth allspice dram and sweet tea. KAMA’AINA FOOD SPECIALS: 25 percent off food at the main bar all day, every day (inside, not on the deck) and 25 percent off food Tuesday nights in the main dining room for dinner seating (bring your Hawaii ID). BONUS: I swoon for the Rum Runner’s menu, but you have to ask for it by name. 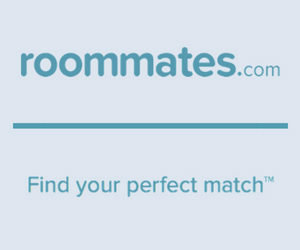 Whisper the words to your server and get a jet lag free pretend visit to the Caribbean. There Dark and Stormy, El Presidente and Corn n’ Oil join sippable aged rums and an elaborate rum cellar.